Chris Hoddle has kindly done a write up of his trip for the Saints match in Romania, if you want to share a story about anything saints related, drop me a message and I'll whack it up! Representatives from Amsterdam, Wales, Kent, Lancashire, London, Long Buckby and even a few from Northampton were amongst the Saintly folk who gathered at Birmingham International Airport, last Friday, 14th December. We joined together with the team to start an adventure to Timisoara, Romania. We were greeted by some friendly faces from both “The Saints” and “Thomas Cook Sports”. 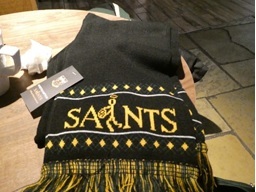 To mark the inaugural partnership between the two, souvenir scarfs were handed out. Although initially there were not sufficient to go around, due mainly to certain players raiding the stocks! This was rectified on the plane when the said scarves were retrieved from the players! The normal pre-flight activities took place and the plane took off just about on time. The Flight lasted about 2 hours 40 minutes, during which time a pleasant meal was provided, with dietary options, and the drinks trolley came round. There was a lucky draw and seat 23a was the lucky winner of a Saints signed shirt presented by Captain Luther. Coaches were waiting to convey the passengers to their hotel destination some 30 minutes away. The team was staying at their own hotel, on the outskirts of the city whilst the rest of us proceeded to two hotels in the city centre. Key cards to the allocated rooms were already waiting along with a complimentary drink kindly provided by The Saints and Thomas Cook. 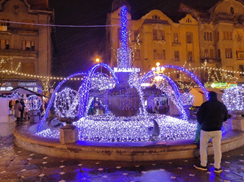 During the evening we were left to explore the local area, especially the Christmas market and the group of young singers performing a series of carols from around the world. 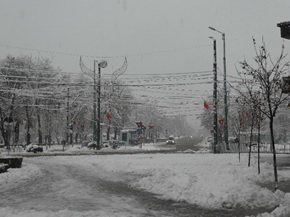 The Christmas scene was added to by the slight flurry of snow that began to fall. 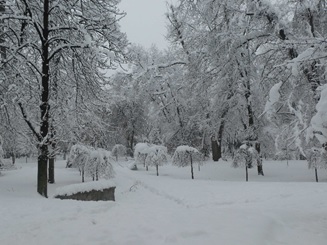 By the time we started to retire to our beds for the night, the snow had started to get a little heavier and about an inch had settled across the city. Waking next morning, the snow had reached a depth of about 4 inches. With no real threat to the match we started on the breakfast spread. There was a whole range of cereals, breads, cheeses, meats and of course the potential of a Full English, albeit it with some dodgy looking sausages! Another morning exploring was due, with check out before 12 and the transport to the stadium at 12.45. 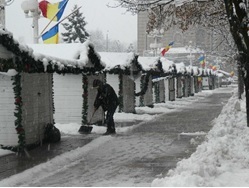 The Christmas market traders were busily trying to cover their stalls from the now quite heavy snow. I was certainly glad of my “Yak Traks” which made easy work of the conditions. The time came for departure to the stadium. As we boarded the coach it was noticeable that the snow was now more than heavy, with several inches making a creating a white blanket. 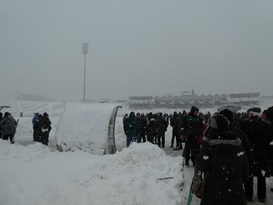 The coaches did remarkably well to get to the ground just after the players arrival. Things looked bleak. The little outside-market next to the stadium was already packing up, and the gates to allow the supporters’ coaches in, were locked. Someone went to try and find a key. Staying on the coaches out of the snow and in the warmth phone calls were made to ascertain the situation.. The officials were making a pitch inspection, soon after, being confirmed as off. 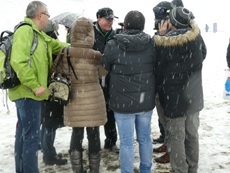 The supporters were invited to look at the conditions. Well, there was clearly no chance of playing the game, even though the local prisoners were trying to clear some areas. 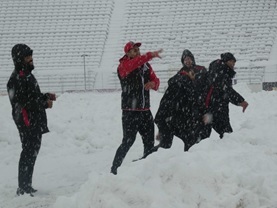 It was noted that the Timisaura Southsea Islander players were engaged in a snowball fight between them and some of the Saintly supporters. The Saintly folk being the winners as they knew what to do. One or two of the Saintly types were intercepted by the Romanian TV. “Bradley” from Berniesbestfriend declined to comment. Tom from Kent refused to actually say that the local ground staff could have done more, although they were desperate for him to agree. The broadcast was due to be transmitted later. I wonder what the Romanian subtitles actually said? It was interesting to note that later, through security, a certain Kentish chap was stopped and frisked…twice! It appeared that Saints were to get 5 league points and a 28-0 win, mentioned by the officials and Chris Boyd, however, as I write this still has to be confirmed. More phone calls were made and it appeared there could be an early slot for our return flight. So there was a quick exit to a small restaurant to watch the players have a post-match meal and a time for the supporters to have a beer. Then off to the airport with boarding cards being distributed enroute. The journey was a little scary bypassing several cars that had spun on the ice and one diversion as a van had become stuck. On arrival we were whisked through security (some of the older travellers being swabbed for “substances”) and into the departure lounge. There we were met with a sea of people whose Whizz air flights had been delayed, no way through to Munich apparently. The early slot came and then went and so on to the original plan. The call came and we proceeded to the departure gate and then on to the plan, although the walk was a little hazardous through the snow and ice. Once on board we settled down only to hear the captain give us an update on departure. Apparently the plane had to be de-iced (hopefully that would be to get the 2 feet of snow off the wings). This would take about 40 minutes to complete but we were 4th in the queue. Time for the in-flight meal. It was a very good Apple struddle followed by beef stew. Time went on and on. Up stepped Paul Hill. He had come up with a quiz for all, consisting of four rounds of ten questions. He did say that the answers had to match his and he couldn’t guarantee they were actually correct. Well it was certainly good fun with players and supporters creating teams. In the end there was a winner with 26 points, seat 22C receiving a Saintly signed ball. Well done to that chap. Hopes were raised as we were next and in about 5 minutes we would start. By now it was around about 9.30pm. 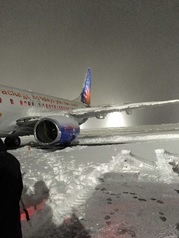 The Captain announced that ATC needed to close the runway for an hour to clear it. Departure time now about midnight. Sure enough, just after the call came that we would be pushed back to the runway and de-iced there. The tug attached and pushed, after about 6 inches it stopped. Too much snow. The cabin crew disembarked with shovels to clear some of the snow around the plane. They were soon joined by members of the team, using their hands to make light work of things. The hitch hikers who we had seemed to accept (the RFU officials) were making the runway inspection. All was clear and ready to go. Where was the tug? Stuck! After the authorities failed to clear it, at 1.30pm it was decided the flight would be cancelled. I think by now many people were glad as it was still snowing and take-off would have been a worry. The fantastic Ben and Michelle from Thomas Cook sprang to work organising transport back to the city and also accommodation in the same hotels. When this was completed we disembarked and by about 3.30am were safely in the hotel rooms. Well done Thomas Cook! The next day out flight would depart about 5pm so an extra morning looking at the city. 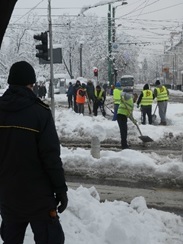 The foot of snow was being cleared by those prisoners again. 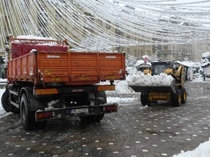 Snow diggers were loading up a convey of lorries with snow. By 11am the square was clear and the Christmas markets were all hard at work. The snow in the wooded areas around the church made a spectacular Winter Wonderland scene. The transport arrived again and took us to the airport. This time it was quite full of other Saintly folk who had made the trip independently. Sadly, it was their turn to be cancelled and they were busy queuing to make new flight reservations and looking for overnight accommodation. Once again we passed through security, yes, Tom was frisked along with what seemed to be every lady. Embarking the plane went quite smoothly, the only apparent slight mishap was that Alan Dickens received a snowball down his neck that made him shiver terribly! Take –off went somewhat more smoothly than the night before. The final take-off was greeted with a rousing cheer! The inflight food had been eaten the night before but the hotel had come up with a packed lunch which was much appreciated. The Chairman gave a speech thanking us for our patience and the player’s professionalism. We touched down in Birmingham about 8pm, for everyone to make their way back to whence they came. Well done to The Saints and Thomas Cook for making the trip unforgettable. All the players were fantastic, even the grumpy old ones! Certainly I shall be using Thomas Cook again even if it was a little more expensive than the independent travellers. Great review Chris Thanks very much. Very good Chris...well done. Bradley will be pleased to see himself! We eventually got home Monday lunchtime. Thanks Chris. Glad you had a good weekend despite the lack of a match! Fascinating stuff Chris......it sounds like you all had a decent weekend despite the cancellation. I notice elsewhere that the compensation culture has reared its head. After a lifetime in the travel business, I understand the frustrations of those who paid good money to watch a game to watch a game of rugby in a foreign land but it looks as though Thomas Cook and the Saints did whatever they could and I hope the same applies to Jet2 as well. Hopefully ECPR will learn something from this...then again, perhaps they won't. Trust all the paying fans got their scarves in the end ! Great review Chris thank you very much. Despite no game,and the weather,seems like you all had a great time. Very relieved that my examination in security didn't become more intimate. It felt like it might. But it's all nothing compared with Gatwick.